Born in Beirut, Maestro George Pehlivanian’s path in music began with piano and violin lessons at the age of three and six respectively. In 1975, he emigrated to Los Angeles with his family and went on to study conducting with Pierre Boulez, Lorin Maazel and Ferdinand Leitner. He spent two summers at the Academia Chigiana in Siena where he was awarded the Diploma di Merito. In 1991 he was awarded the Grand Prize at the Besançon Conducting Competition, the first American ever to receive this award. Since then Maestro Pehlivanian has conducted at many of the leading opera companies of both Europe and the United States, including performances of CARMEN for Long Beach Opera, California, JENUFA for Israeli Opera, LA TRAVIATA at the Mariinsky, St. Petersburg, TOSCA at Grand Theatre, Bordeaux, the Dutch premiere of RIDERS TO THE SEA in Rotterdam, LA VOIX HUMAINE and JEANNE D’ARC AU BUCHER at Cite de la Musique, Paris, EVGENY ONEGIN at Teatro Verdi, Trieste, OTELLO, CAVALLERIA RUSTICANA and GIANNI SCHICCHI at Teatro San Carlo, Napoli, PIQUE DAME and ANDREA CHENIER at the Teatro Lirico, Cagliari, LE DAMNATION DE FAUST at Teatro San Carlo, Napoli and Teatro Regio, Parma, the world premiere of LE JOUR DES MEURTRES by Pierre Thilloy for l’Opéra-Théâtre de Metz and BORIS GODUNOV for Teatro Massimo, Palermo. On the concert-platform he has led many of the world’s leading orchestras including the London Philharmonic Orchestra, the Philharmonia, Israel Philharmonic, Orchestra del Teatro di San Carlo, Nationaal Orkest van België, Filarmonica della Scala, Orchestra of the Teatro dell’Opera di Roma, Saarländisches Staatsorchester, Orchestra dell’Accademia di Santa Cecilia, Rotterdam Philharmonic, Orchestre Philharmonique de Radio France, Monte-Carlo Philharmonic, Maggio Musicale Fiorentino, Orchestra Nazionale della RAI Torino, the BBC Philharmonic, Bamberger Symphoniker, the Norddeutsche, Hessische and Südwetsdeutsche Runfunk Symphony Orchestras, Orchestre de la Suisse Romande, Teatro Comunale di Bologna, Orquesta Nacional de España, Orquesta Radio Television de España, and Royal Scottish National Orchestra among others. In North America he has conducted the Montreal, Baltimore, Houston, Cincinnati, Indianapolis, St. Paul, Vancouver and Toronto symphony orchestras. He has also worked with the Russian National Orchestra, Moscow Philharmonic, Kirov Opera Orchestra, Sydney Symphony, Japan Virtuoso Symphony, Malaysian Philharmonic, Hong Kong Philharmonic, Leipzig Gewandhaus, NDR Hamburg and the Qatar Phiharmonic Orchestras. In Winter of 2017 Maestro Pehlivanian made history as the first conductor of Armenian descent to conduct a Turkish orchestra, leading performances with the Presidential Symphony Orchestra of Ankara. He has collaborated with renowned artists including Leonidas Kavakos, Vadim Repim, Sarah Chang, Joshua Bell, Janine Jansen, Misha Maisky, Gidon Kremer, Jean-Yves Thibaudet, Gil Shaham, Arcadi Volodos, Emmanuel Ax, Lynn Harrell, Maurice Andre, Evelyn Glennie, Soyoung Yoon, Mirella Freni, Ruggero Raimondi, Dimitri Hvorostovsky, Leona Mitchell, Bernarda Fink and Marjana Lipovsek. 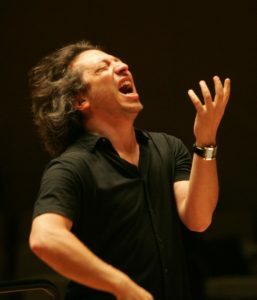 Maestro Pehlivanian has been Chief Conductor of the Slovenian Philharmonic (2005-2008) and has held Principal Guest Conductor positions with the Residentie Orkest of The Hague (1996-1999), the Wiener Kammerorchester (1996-2000), the Staatsphilharmonie Rheinland-Pfalz (2002-2012) and the Teatro Lirico di Cagliari. He has appeared at many of the world’s most important music and arts festivals, including the Maggio Musicale Fiorentino, White Nights of Saint Petersburg, Festival Bruckner of Linz, Verdi di Parma, Rávena, Aspen, Ravello, Ljubljana, and Granada. His discography includes a double CD release on Virgin Classics/EMI with the Monte-Carlo Philharmonic, recordings for BMG with the London Philharmonic, the world premiere recording of music by Zhukov under CHANDOS with the Residentie Orchestra, works by Rodrigo with the Orquesta Nacional de España STUDIO SM, as well as Liszt’s complete works for piano and orchestra with Louis Lortie and the Residentie Orchestra for Chandos, with the latter recording receiving special praise by Gramophone Magazine. In 2011 George Pehlivanian founded the Touquet International Music Masters in France, a unique festival assembling the National Youth Orchestras of Europe. Since 2012 he is Professor at the Conservatoire National Supérieur de Musique de Paris (CNSMDP) and since 2013 has taught conducting at the Higher School of Music Education ‘Katarina Gurska’ in Madrid.